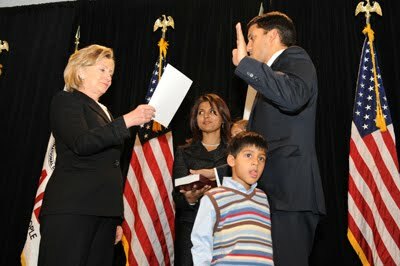 Dr. Shah’s swearing in by Secretary Clinton does have some precedence. When Andrew Natsios became USAID Administrator in May 2001, he was sworn-in by Secretary Colin Powell. Henrietta Fore, Dr. Shah’s most recent predecessor became the 15th Administrator on December 2007. She was sworn-in by Secretary Rice. Natsios was USAID Administrator prior to the creation of the “F” bureau. Fore was USAID director after the creation of the “F” bureau and she served concurrently as the second Director of Foreign Assistance. It is perhaps telling that the new USAID Administrator has not been identified as also director of the “F” bureau. If the USAID Administrator is not the Director of Foreign Assistance in the DOS structure, then who is? … The pressures to avoid rocking the boat, to avoid dress and behavior which depart from the norms of the group, to avoid expression of controversial views are of the subtle, unspoken kind which are hard to document. But we have the testimony of a broad cross section of the officers whose views we sought that they are a powerful, all pervasive influence. Such pressures, of course, are the death of the creative impulse (U.S. State Department, 1970, p.310). Senator Lugar in his piece makes two important points in this new engagement: 1) less control of the message and 2) nimbleness, flexibility and innovation in engagement. Both points are still kind of “foreign objects” in the State Department’s galaxy. I have no doubt that the desire to control the message is what cause the demise of Madam le Consul’s blog. The “tried and true” in the bureaucracy is often preferable than “wild ideas” or even simple new ideas. The prevailing wisdom might be that shutting her down “protects” her and of course, by extension the mother ship. But how can an organization presume to “beat the enemies” at their own game when it has low tolerance for employees engaging with “friendlies” on the web. And if you can get in trouble for saying something that has not been cleared through the 12-steps program within the mission and the bureaus, how can you encourage flexibility and innovation? Senator Lugar says “we must come to the battle armed with the most modern tools at our disposal.” I hate to tell Senator Lugar this. The tools are here alright. Bright and shiny and ready for razzle dazzle. But “control” and “culture” have not shown up for the party. It remains to be seen if they’ll make it here before 2050.